Pick up from your cruise terminal by our private English speaking guide, who will hold your name sign for you to recognize. Start our sightseeing at Yu Garden of the Ming Dyansty, which features exquisite layout with rocks, ponds, pavillions, trees and flowers. Come to the nearby Chenghuangmiao Bazzar to hunt for some interesting local souvenirs. Then visit the Shanghai Museum in the city center. The museum enjoys high reputation in the world as a musuem of ancient China arts. Move on to the symbolic attraction of the city-the Bund. You will be impressed by the foreign style buildings of the city’s colonial period, like “a fair on world architecture”. Finally let’s come to the premier pedestrian shopping street-Nanjing Road for fun. Visit the other main attraction in the city center- Shanghai Urban Planning Exhibition Hall. The museum showcases the achievement of Shanghai city planning and construction. The antique style Jade Buddha Temple could bring some peace in your heart. Stand on the obervation of China’s 2nd tallest building-Shanghai World Financial Center to have an amazing view of the city. Then head for Xintiandi. It is the liveliest entertainment area in the city, where you will see a perfect integration of traditional Shanghai Shikumen houses with modern bars, cafes, restaurants, and stores. 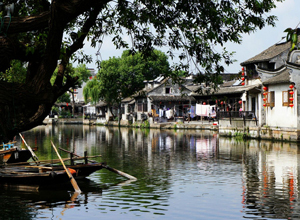 Today we will visit the Xitang Water Town, about 90km away from Shanghai. Xitang is a famous town with thousands of years of history. It is famous for its large number of covered corridors, lanes and old-fashioned stone bridges. Be transferred back to your cruise port after the pleasant journey.